While it is doubtful that US President-elect Donald Trump ever read George Orwell's 1984, Trump's cabinet choices appear to come right out of the doublethink that ruled Orwell's dystopian society. In Orwell's book, the Ministry of Plenty rationed essentials while the Ministry of Truth manufactured falsehoods. 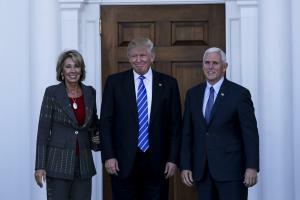 Trump's choice for Secretary of Education, Betsy DeVos, is perhaps the most extreme of Trump's cabinet nominees.